Halloween is still over a week away, but you can certainly tell with today’s articles that orange and black is certainly on the mind of Trev’s Bistro. Tonight is of course Game 7 of the National League Championship Series between the St. Louis Cardinals and the San Francisco Giants at At&T Park in San Francisco. And since the Giants will win (knock on wood), the World Series will then begin in San Francisco on Wednesday. At&T Park is certainly in the spotlight now. It would be a treat to write this Monday neighborhood installment on the dining choices inside the ballpark. 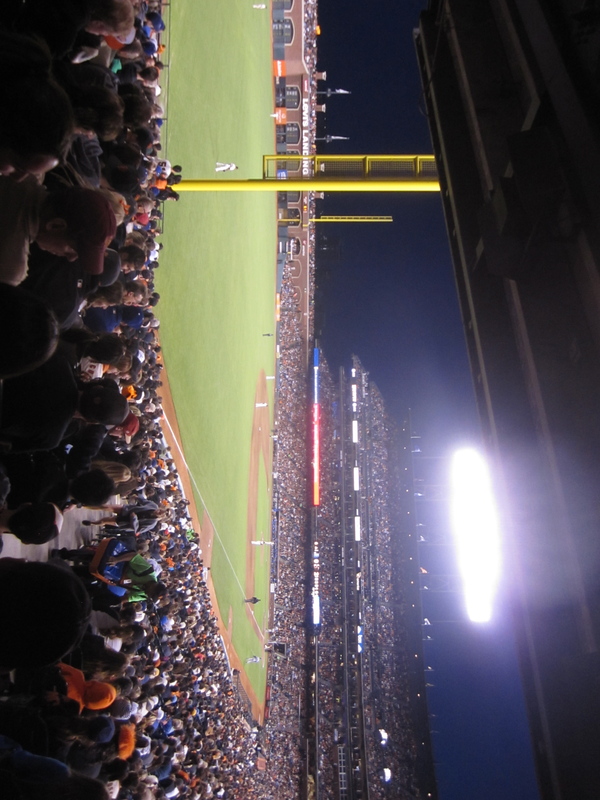 Unfortunately, most of us aren’t spending $500 for standing room only tickets, so let’s focus on the wealth of dining and drinking options that surround At&T Park. Since the ballpark opened in 2000, it is truly astonishing how the surrounding area has experienced a complete renaissance. At&T Park may be America’s premier ballpark and it is also possibly the premier symbol of how a ballpark can change a previously neglected neighborhood into a thriving one.The neighborhood has all sorts of names. In theory, At&T Park is located in SoMa (South of Market), a region that covers a vast part of the city, with a wide spectrum from some of the city’s most beautiful blocks to Sixth Street and some of the grittiest eyesores of the city that you never see in those sparkling Golden Gate Bridge pictures. SoMa is now the land of pricey lofts and former warehouses turned into start-up offices. At the edge of SoMa on Market Street a little company called Twitter has its headquarters. At&T Park is also located at China Basin, South Beach, and Mission Bay. Just south of the ballpark, Mission Bay is a major biotechnology hub, complete with the UCSF Mission Bay Campus. China Basin is the old name for the Mission Creek Canal that the Lefty O’Doul Bridge crosses over right by the ballpark when you walk in from the parking lots. South Beach is the area north of the ballpark along the Embarcadero with some lovely apartments leading to the Bay Bridge and Rincon Hill. No, this South Beach is nothing like its flashy sister in Miami. Beginning in South Beach, walking to the ballpark on the Embarcadero you have two options for waterfront dive bar/cafes for a pregame Anchor Steam, coffee, and seriously excellent, unpretentious burgers at the Java House or Red’s Java House. At Delancey and the Embarcadero is the Delancey Street Restaurant, a training ground for the Delancey Street Organization, the country’s largest self- help residential organization. Momo’s anchors the corner of Second and King (Embarcadero) across from the Orlando Cepeda statue entrance to the ballpark. You’ll always find the largest crowds here filling up before games and the place gets quite empty on non game days. Continuing up Second, you’ll find Paragon, Ironside, Ozone Thai, and arguably the area’s favorite lunch spot, The American Grilled Cheese Kitchen. Also on Second is 21st Amendment Brewery, with a superb “Hop Crisis” Double IPA and a dark IPA called “Back in Black.” The food is much more impressive than your average brewpub too. Skip the signature “Brew Free or Die IPA” and the “Hell of High Watermelon Wheat.” 21st Amendment was also one of the first craft breweries to produce in cans, now a very trendy thing for breweries to do. The American Grilled Cheese Kitchen lies at the entrance to the small, charming South Park, a very welcome oasis of green amidst a sea of old warehouses. The Butcher and the Chef is a classic French cafe on the park, with excellent crêpes and baguette sandwiches, exactly like in Paris except at twice the size and price. Caffe Centro is the park’s coffee spot and South Park Cafe is your other lunch option. Note how critical lunch is in this neighborhood. Dinner and nightlife? Not so much. But entrepreneurs sure do lunch. At Third and Brannan, you’ll find the popular sports watering hole Zeke’s and not your regular pad thai at Koh Samui & The Monkey, yes that’s its name. Across from the ballpark’s main Willie Mays Plaza entrance at Third and King is the Lucky Strike Bowling Alley and Restaurant, in a former Borders. San Francisco loves its bowling alley-bar-restaurants nowadays (see Mission Bowling Club). One block away at Fourth and King is the CalTrain station. Right across from the station, enjoy some Ritual coffee at The Creamery and pretend like you understand how to be a computer programmer when listening to the complex discussions going on here, accentuated by the caffeine. Make sure to check out the whirlwind global wine adventure that is K&L further up Fourth Street, along with a lunch (or better yet dinner) at Loretta Keller’s excellent California meets Mediterranean bistro Coco 500. The beef cheeks, tempura green beans, flat breads, and bittersweet chocolate vacherin all could be on a list of the 50 most important dishes in the city. Whatever you do, don’t skip the vacherin! Nearby is Alexander’s Steakhouse and Le Truc on Brannan. The former is a, you guessed it, splurge steakhouse, and the latter, you guessed it again, a gourmet food truck parked at lunch on weekdays. Just off Fourth on Bluxome is the Bluxome Street Winery, one of the first urban wineries in the country that has now ignited a movement nationwide. Sample the wines in the tasting room, but no, the grapes aren’t grown right outside the tasting room. They come from an assortment of vineyards up north in Sonoma and the Russian River Valley. The dining along King Street from CalTrain to the Second Street edge of the ballpark features those shiny miniature chains that seem to be the sign of second stage urban gentrification, when the corporations start realizing a goldmine area. Burger Joint, Philz Coffee (an example of an excellent mini-chain), and Amici’s East Coast Pizzeria all can be found here. Panera Bread doesn’t count as a mini chain. Pete Osborne’s Golden Bear group of restaurants anchor the immediate area around the ballpark, with the aforementioned Momo’s, Pedro’s Cantina, Pete’s Tavern, and the upcoming Mission Rock Resort. Don’t even try to squeeze into any of them tonight or during the World Series, unless you have a spare $250,000 to rent the places out. The highlight stretch of dining around At&T Park would be Townsend Street. 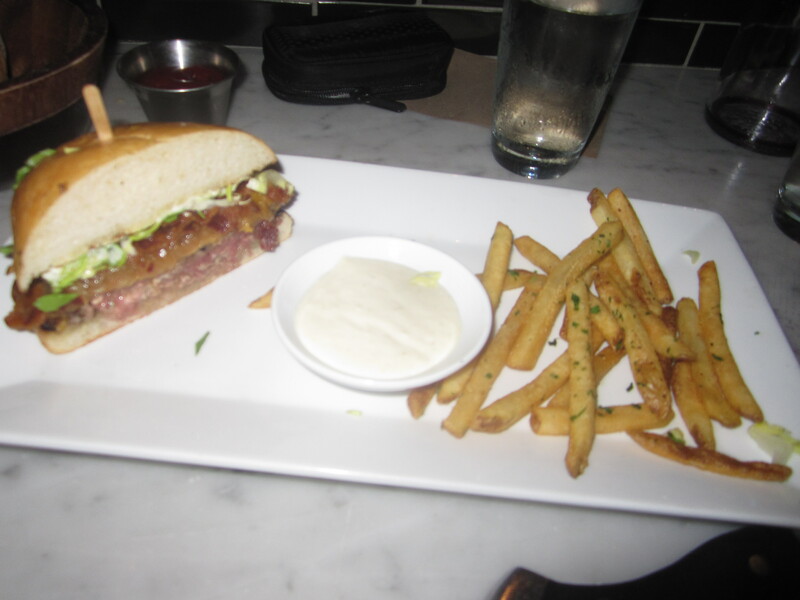 By the train station is Marlowe, from restaurateur Anna Weinberg, and home to one of the city’s leading burgers, with lamb added to the patty, bacon, and a superb horseradish aioli. Chef Jennifer Puccio (she and Weinberg are also behind the excellent Park Tavern not near At&T Park) isn’t just a burger chef. Her poulet vert is maybe even more satisfying than the burger, along with any salad, and some of the best fries I’ve encountered, cooked in rice oil for an extra dimension of crunch. All fries should be cooked in rice oil. Further along Townsend, sample excellent small plates and the impressive wine list at The District, margaritas and tacos at Tres, or better yet, grab a burrito for the game at the smaller than a hole in the wall Victor’s, next to The District. A pair of alleys off of Townsend boast terrific, hidden finds that are actually not secret finds at all. The whole city knows about them. Little Skillet is a walk up window specializing in fried chicken and waffles. The chicken was slightly dry during my last visit, but do be certain to enjoy the waffles and brown sugar-black pepper cream biscuits. Or be unique and try a catfish po boy or shrimp and grits. On the Lusk Alley is 25 Lusk, the unofficial Happy Hour headquarters for the SoMa power players, with one of the city’s most dramatic spaces, and excellent cocktails that get better as the crowds die down. 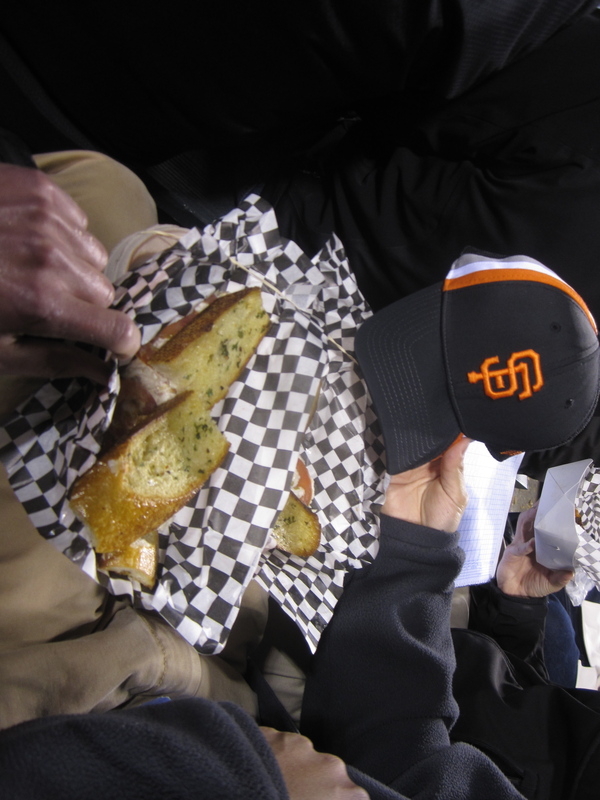 Of course, no visit to At&T Park is complete without eating and drinking in the ballpark…well, the restaurant on Willie Mays Plaza attached to the ballpark, but you don’t need a ticket to go in. The Public House, from Traci des Jardins (an Iron Chef and chef-owner of Jardiniere), happens to have one of the city’s best craft beer menus. Next door is des Jardins’ taqueria, Mijita. Now that we’ve eaten all over this neighborhood, it’s time for the game. And for that, get a Krazy Krab Sandwich and a Speakeasy Prohibition Ale out in centerfield. Enjoy! This entry was posted on October 22, 2012 by trevsbistro. It was filed under Neighborhood of the Week, San Francisco .